We had a great time to try out the Nexus 4G’s Google Wallet feature at McDonalds. Thanks to Stewart Pearson, we were able to have this hands on experience with it. Indeed, the world has lost a very inspirational figure, with the magnitude of sadness at an unimaginable level. It’s definitely a trending topic on Twitter and Facebook as well. In fact, I believe the death of Steve Jobs is the start of era for many new visionaries. Many have posted up videos of his inspirational speech at Stanford College and everyone loves it. Even though many have not seen the video which has been posted for more than 3 years ago, I believe this time, many will be inspired by how a visionary thinks and react. And with that, the younger generation will strive even harder to make their dreams come through cause it is proven now that life is short and we should do what we are passionate about and live by it as if our next day will be our last. I know it certainly make me realise even more now on what I want to do in the future. The urge should not be held back anymore and it is all about action and going forward with nothing to lose, cause the only thing to lose in life is by not doing what you want. I hereby end the post with some great stuff of Steve Jobs that you all can watch and read on. Steve’s Classic Commencement Address at Stanford University. 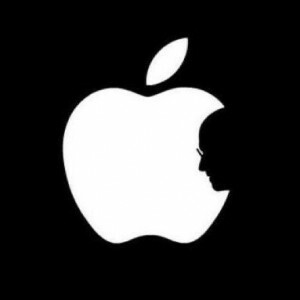 Jonathan Mak, a Hong Kong Polytechnic student, paying tribute to Steve with his design. People left messages and flowers at the Apple store in New York City. Here is a good collection of Steve Job’s quotes listed on Mashable. The quote below goes down as my favourite among all. There’s nothing to lose if you put your heart and soul guys. Upgrade to iOS 5 Now !! 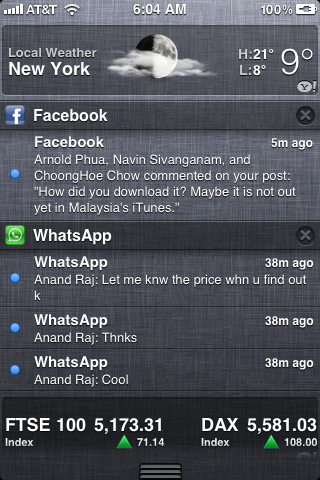 October 5, 2011 / Wee / Comments Off on Upgrade to iOS 5 Now !! Yup, that’s right readers, you can now upgrade your iDevices to iOS 5. Firstly, I want to thank my friend, Navin for telling me about this and guiding me on how to do it. I won’t be able to wipe a tear if it weren’t for him. Alas, the long awaited OS is finally here. Before I advance with the details, I would like you to proceed at own risk. I will try to make things as clear as possible here but it’s not guarantee a 100%. If you are afraid, please wait till October 12. First, you will need to get iTunes 10.5 beta. Although some websites recommend the Beta 9 version, but currently Beta 9 for PCs (Mac lovers don’t boo me) are not hard to be found, so sticking with Beta 7 would work quite well for now. Download the iTunes 10.5 Beta 7 here and then Install it. *After you open the download direct link, please choose the hotfile platform, as that seems to be working. You will be prompt to restart after installing, so make sure you save all of your work and then restart. Next, time to download the iOS5 🙂 Make sure you download for the make of your phone and not blindly just download any link. The full list of links can be found here. This will take a while, depending where you are, ranging from 40 minutes to 4 hours. You will see a .dmg file on your desktop once it’s done. Now, go download PowerISO for free (pay if you are generous) and install it. Then watch this great video by LVTradegy showing you how to extract the iOS file from the .dmg file. After extracting it, please connect your phone to iTunes and sync your newly downloaded apps to your itunes, transfer purchases and backup all the data. Then go back to the Summary Tab. For PC users, please press shift+restore; and for MAC users, please press option+restore and choose the iOS file on your desktop. LVTradegy does guide you on this part as well. After that just sit back, relax and enjoy. Make sure you restore all of your data back to your phone. 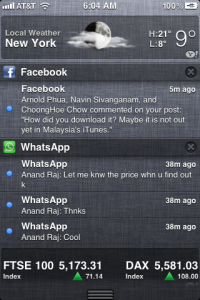 You can check out the list of features of iOS 5 here. If you really have to know the full list of the new 200+ features that comes with it, read this great article. The notification feature is really cool and the interface of keyboard sliding down in iMessage really shows why Apple is the quality. For me, reminders app is the bomb as any thoughts or tasks can be access in a user friendly way now.